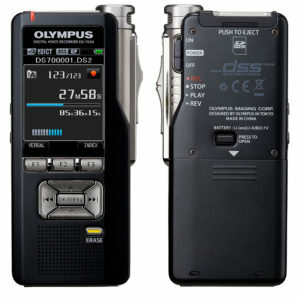 Olympus develops and markets intelligent, complete speech documentation solutions, SDS for short. With more than 45 years’ experience, Olympus offers intuitive hardware, workflow-supporting software, and tailored service, for efficient, future-proof Speech-to-Text solutions. The high-tech products for mobile and stationary dictation, as well as for transcription, are the key to professional, secure, and profitable work in all industries. With its comprehensive approach, Olympus is helping to considerably simplify the everyday work routine. Below is an overview of the most popular hardware devices provided by Olympus, that are compatible with our solutions. 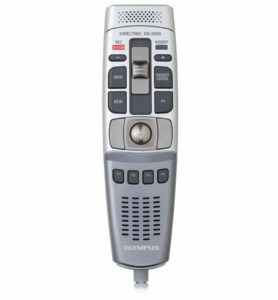 The Olympus RecMic DR-2300 has a powerful integrated speaker for clear playback, it also has a directional microphone to help to reduce background noise. It has a mulit-functional slide switch and ergonomic design. Built-in volume control for convenience. This device has been built for durability with it’s metal‑bodied unit. It has a large colour LCD screen to provide the best usability with maximum recording quality. This module enables automatic allocations of voice files to unique case, client or patient records. 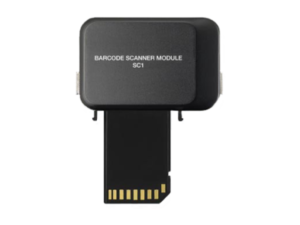 It eliminates the possibility of mistyping to ensure 100% conclusive and secure identification. This therefore boosts workflow efficiency, effectiveness and veracity. Batch Scanning and further Workflow options together with Olympus Dictation Management Software “DSS Player Pro R5”.